The Pro-Mount allows a chuck or faceplate to be held in the best position needed for carving and texturing. The work piece can be easily rotated 360˚ by using the outer handle on the A. Pro Mount Body. The work piece can be pivoted up to 360˚ by using the inner handle. With the handles tightened, the work piece is held firmly and will not move. B. The Threaded Spindles are available in sizes to match most lathes and are drilled through to allow for a vacuum set up. 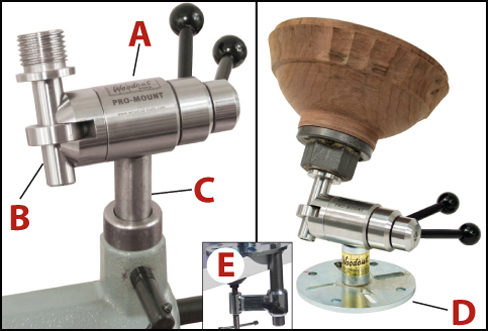 C. The Tool Post threads into the Pro-Mount Body and is held in a tool rest base (banjo) on your lathe. D. The Bench Stand threads in to the Pro-Mount Body and can be screwed to a table or mounted on a drill press. E. The Table Clamp attaches to the bench stand, and is easily fastened to a table without damaging the surface. This makes the unit very portable.